Daryl Irvine knew how his big league time went wrong, he just didn't know why. In spring 1993, as Irvine saw that his time with the Red Sox might be done, he was still trying to figure it out. "When I'd get on the mound at Fenway, sometimes I'd overthrow," Irvine told The Hartford Courant. "In Pawtucket, I was always right in the zone with my forkball. It doesn't make any sense. It's a puzzle." Irvine's time with the Red Sox was done, traded by the start of April to the Pirates. As it turned out, his time in the majors was also done. Irvine's career began in 1985, taken by the Red Sox in the first round of the January draft out of Ferrum College. He played that first year at single-A Greensboro, going 4-2 in seven starts. He moved to single-A Winter Haven in 1986, going 9-8 in 24 starts. His ERA was 3.19. He picked up one win in July, going seven innings, giving up three hits. Irvine arrived at AA New Britain in 1987, where he would stay for the next three seasons. There, he went 4-13 his first year and 5-11 his second, as both a starter and a reliever. 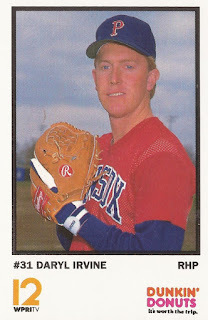 In his third season, in 1989, Irvine posted a 1.54 ERA in 54 total outings. He arrived at AAA Pawtucket in 1990, he posted a 3.24 ERA in 42 outings. That April, he made his major league debut, a one-game stint. He gave up three runs in one inning of work. He returned to the Red Sox in August, getting 10 more outings. Called back in August, the Red Sox hoped Irvine might be their late-game solution. In those 10 outings, Irvine gave up seven earned runs in 16.1 innings of work. In 1991, he got 27 more outings at AAA Pawtucket and nine back with Boston. He got his most big league time in 1992, 21 games. He posted a 6.11 ERA. By the start of the 1993 season, Irvine arrived with the Pirates, traded there for Jeff Richardson. Irvine, though, spent the year at AAA Buffalo, getting into 37 outings, posting a 4.30 ERA. It was his final season as a pro. Irvine returned the next spring with the Pirates, but didn't play during the year, ending his career.